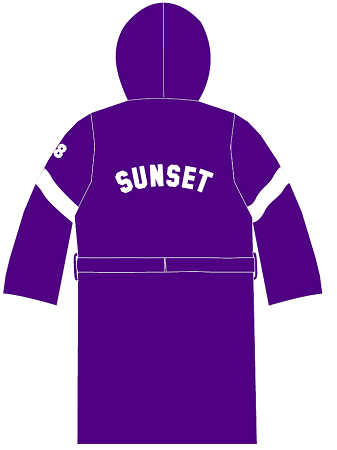 Highest quality Purple terrycloth robe and inverted V on the front, with white stripes on the arm. 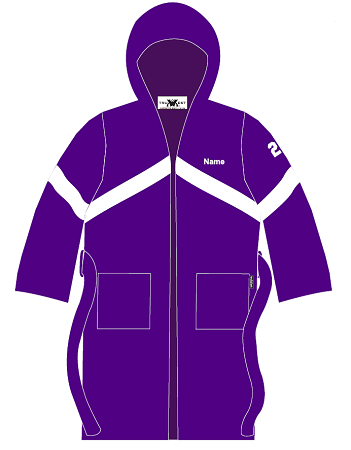 The robe includes a hood and triple stitched stress seam construction. It also comes with front pockets and belt. Custom lettering on the back straight and centered in an arch SUNSET (price of lettering included in robe price). Additional enhancements may include the players name, this is optional and can be added to the front left hand chest for additional cost of 4.00 per word in White. Please note: S. Smith is one word. Numbers on outside sleeve maybe added as well. 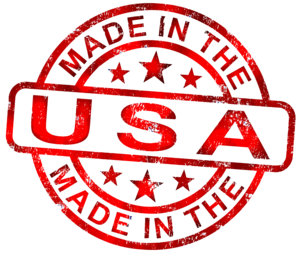 We proudly make all truWest swim parkas in the USA.